StP Ruin, Mont de Neufchâtel. R669 casemate for field gun with a 60deg. field of fire. StP Ruine, Mont de Neufchâtel. The track lading to the rear of the battery. An RAF reconnaissance photo of the area. This battery was always sighted just over the hill on the rearward slope, it had no direct firing positions. 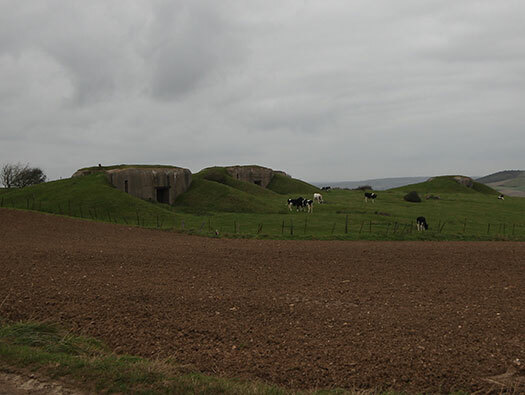 When the casemates were built, they were placed just in front of the old gun line. A side view of the battery. Direction of fire Mont St-Frieux. 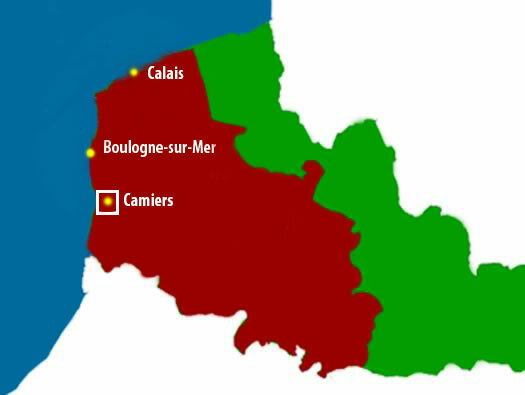 It covers the area around the Mont St-Frieux complex of batteries and bunkered head quarters and then the beach from St-Cecile Plage to Hardelot-Plage. 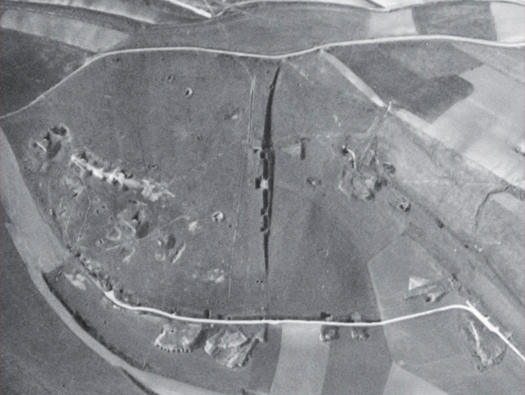 Air photo of the batterie. 1 to 4 white - Casemates. 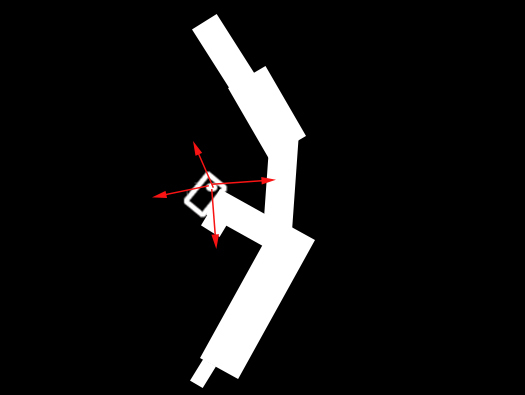 1 to 4 red - Geschützstellung, open gun emplacements. 4 x White squares - ammunition storage. White road - the German concrete roadway (this part now removed). Yellow lines - the souterrain (underground). Turm 4 an R669 casemate. 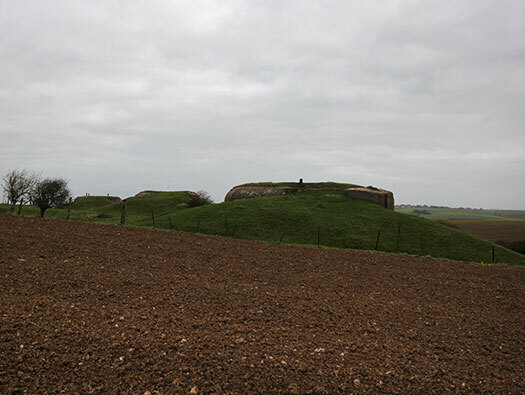 Camouflaged and protected with earth piled up and over the casemate made it a harder target to see and thus a harder target to hit. A side view of the gun line. A very narrow embrasure and I am never sure what the large concrete block built into the side. This is the concrete bock from the inside. The view inside the embrasure. All these casemates have the same camouflage inside and out. We think that it maybe used as a test for noise deadening? Close up of the camouflage. Interesting shape set into the wall? It may be to take a different style of gun, one with a split trail? Close up of the shape. This is where the gun would have sat. The left ammunition niche with the fan to remove smoke from the gun room. Smoke extraction in an R669 casemate. When the reinforcement bars are wired together, the pipes placed between them before the concrete is poured. The second niche in all these casemates seems to have a lower floor level. I have never seen this in any R669 casemate before. 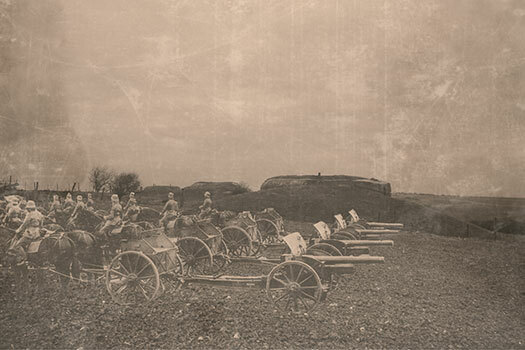 Each artillery Battery held its ammunition in units of fire. 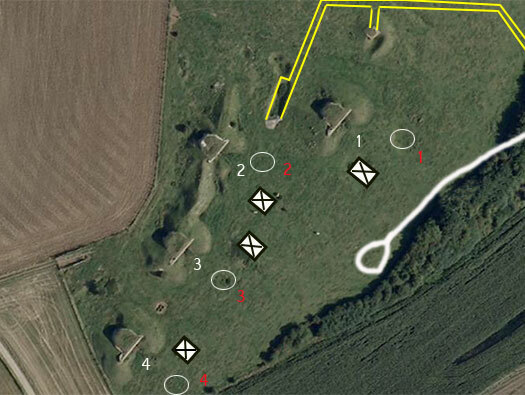 I am not sure how much is in units of fire but I believe that batteries around D-day had about 3 to 4 units of fire and the rest was stored quite a way behind the initial battle area ready to be driven up to the gun line. All these casemates had rear doors but two are I think 494P2 and two completely different frames. I am quite broad shouldered and carry a bit of weight and I struggle to enter and leave these Tobruk's without hitting my head, I have always wondered how a fully armed and helmeted soldier could charge up or down these steps? The two niches, one is for a voice pipe to connect with the inside, the larger one I am not sure. Looking up into the Tobruk. The view from the Tobruk. A 360 degree view around the battery. Could be a 2cm Flack field position. There were two 2cm Flak guns here. 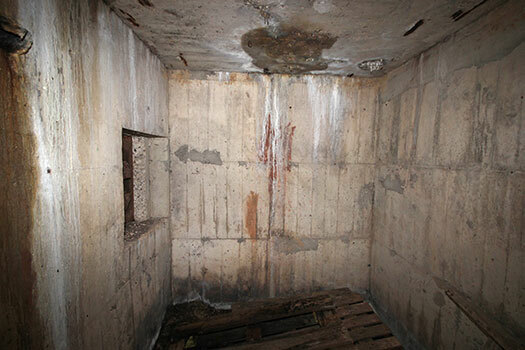 Behind each casemate is an open emplacement, Geschützstellung. These positions allowed a 360degree field of fire. But were vulnerable to air attack, so the guns were put into casemates. How they may have looked. A nice view of the rear of one of the R669 casemate. The Tobruk on the left side and camouflage set into the concrete. Close to each Geschützstellung is an ammunition store. It looks like a trench dug into the ground and a brick and concrete roof put over the top, Stollen. Self made probably by the batteries own soldiers. Also a new found push-me-pull-you cow. Cordite powder bags in their wooden box. A shaped barbed wire support post called an Eisenpfahel and it has a flat plate base, so a hole is dug and the post is placed in and the hole filled and tamped down. Easier that banging into the ground and can be carried out very quietly so not disturbing an enemy. 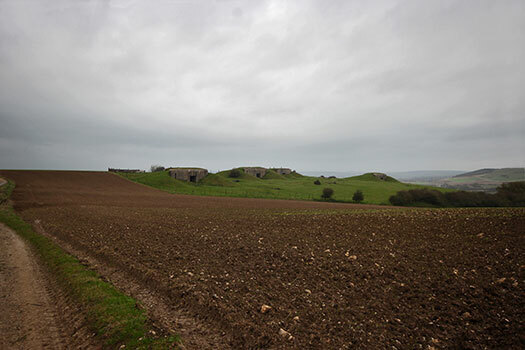 The whole site would have been behind a defence of barbed wire and mines, if there were mines available. Three casemates have Tobruk's. The round hole by the door is to allow the foul gases to be removed from the gun room via a fan extractor in the left hand ammunition niche. The routes of the extraction pipes. Why the camouflage was continued inside the casemate as well as outside, I have no idea. An explanation could be that an order came down to camouflage the walls and the builders did exactly what they were told. I do not know exactly how these shapes were produced so evenly, usually a cement bag would be screwed up into a ball and set into the concrete. But this is too even and must have taken quite a lot of working out. These look to be RAD workers, boys too young to join the army and too old for school. So RAD was formed to use this ready made workforce in the construction industry. Todt workers. Todt a private company built many of the German wartime buildings and infrastructure. Note the hinge pin has a bolt to stop the removal of the pin. Another completely different door frame. There must have had several different door frames of the correct size in the stores. At Merville Wn01 the gunners were told to open the doors when firing the gun. 1. If suction for exhaust is inserted switch it on. 2. When shooting keep doors open. 3. Throw cases immediately into the case-pit or remove them out of the room. 4. If smoke is in the fighting-room use gas mask with CO filter. This is stenciled on the walls of a battery of R669 casemates in Brittany at Mo86c. I have found this picture of a casemate door that may have fitted here. Nice grading of the earth. Note the pieces of concrete to hold the earth and grass on the top bunker. Another first here to see these concrete pieces to hold the earth and grass on the roof. The entrance into a tunnel system that runs down to the valley. The nicely earth camouflaged entrance. Note the hooks over the entrance for a camouflage net. The entrance is blocked to us humans but open to Bats. Steps going down a long way. Tunnel system No.3. Its the yellow line.. Sitting on the top is an attached Tobruk. This Tobruk protects the tunnel system and can be used in local defence and anti-aircraft role. A heavy piece of steel sticking out of the concrete, I am not sure what it was for. Its a piece of railway line. The whole area around here was bombed heavily throughout the latter part of the war. There was a bunker or part of the tunnel system No.3. An area defence Tobruk is behind it. This whole area would have been wired off from outside. The top of the Eisenpfahel. Mines that were removed from another defence. This is upside down, as you see it has a flat plate riveted on. This means you dig a hole, place it in and then fill in and tamp down and can be carried out quietly. The other reason it could be like this is to sit a lamp on it shining in one direction so the enemy cannot see it. The German concrete military road under the grass. The yellow line is the roadway. This is where the road ends In a circle to drop off ammunition. White road. A small building in the bushes. Built with local French bricks. Plan where this Abri is situated. The front with a blast wall. Possibly a battery office where all the paperwork was done? The inside at the front. Note the white pained dado line and pink underneath. This would be quite a dark room with only small windows. The first entrance to this tunnel system No. 2. This is the right hand entrance and on the right above should be a Tobruk. Plan of the tunnel No. 2. This is inside and a Bat heaven. The view over the wall. Plan of tunnel No. 2.. This is the second entrance and hard to clamber through to get in. Plan of tunnel No. 2. This is looking up, an escape hatch or a way to a defence Tobruk?? I think this tunnel system is very like the next one that we entered. Above the straw bales you can see a square piece of concrete and that is the next set of tunnels. The trees are where the rubble removed from the tunnels and dumped there. The trees have subsequently grown up there. Straight in front is the second tunnel. Its two entrances and continuing on the road to the right are two more small garage tunnels. The woodland on the right is the spoil heaps from the tunnels. Could be the staff car garage of the battery commander. Probably for the commanders car. These two tunnels are slightly different? this one is more rounded. The view from the last garage. Looking back up the valley with the roadway running off with the battery on the hill. Tunnel No.1 the second entrance now blocked off. There was or is a Tobruk defence to the right and above the entrance. We did not find this one. Tunnel No.1 the first entrance defended. A large defence block at this entrance, this was the main entrance and would have been a guard room where soldiers entering and exiting would sign in and out. Plan not to any scale. Make sure you sign in when you enter and out when you leave. Close combat window machine gun. There would be a table in the room where all the soldier records would be kept making sure that they were booked in and out of their accommodation. Close combat and guard room. Tunnel No.1 was accommodation for (we think) 80 fully equip troops. Ten rooms for eight men. A second line defence with another close combat window and a chicane entrance. This probably would not be manned unless there was an emergency and any of the soldiers inside could man it. Going through the chicane entrance. A gas tight thin steel door. Plan of a 19P7 door. This may have been a water cistern or a stove. There is a stove pipe going out of the wall. There is electrics inside the tunnel as we have seen cable fittings on the walls. We think this is part of an exhaust pipe for a generator that would have been at the far end of the tunnel as this pipe runs right through. It also may help with heating? In a small way. The view down the main accommodation tunnel. There are ten rooms along here, all may have had a wooden door. We counted four bunks each side. The pipe on the far wall may have been a fresh air ventilation system. Four bunks on each end wall. How it may have looked with the thin brick wall and a set of bunks bolted to the wall on both sides and then a chain holding the other side to the roof. They may have had a standard wooden cupboard for each soldier to store all his kit. The floor has a thermoplastic tiles. This would be a warmer floor than just concrete. The far few rooms were painted. You can see the exhaust pipe running through and clips on the wall for lighting. The last one has been demolished??? The recess in the end wall I think is where the generator sat. Now walking along the second exit. 19P7 door had a small glass pain in it so you could see what was on the other-side and a rubber seal around the edge to seal against gas. looking back at the chicane and the close combat embrasure. And onwards and out - but its closed off. Looking back along the accommodation. The next items are in the bushes on the far right. This is the end of PART 1. Part 2 will be the bunkers on the hill.